Golden Axe is one of my favorite games both on the Genesis and in the arcade, so I already knew that I was going to hold this PC Engine CD version to a high standard. The game starts off well enough; an animated cutscene complete with voice over, a title screen than looks more colorful than other ports, and then an even longer cutscene after the character selection screen. Much more cinematic than the Genesis release! Then the game starts, and the first thng that you can’t help but notice is the graphics. 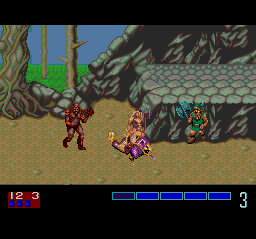 I imagine that this must be what Golden Axe would look like on the NES, because it definitely looks worse than the Sega Master System port. The controls are horrible as well – stiff and unresponsive. Exactly what you don’t need in a beat ’em up (or any game for that matter.) The animation is choppy, and the game runs slower than it should. Although the title screen music seems oddly out of place, the in-game tracks sound great, and rival the Sega CD port of Golden Axe in terms of quality. This is the one place where the game really shines. Unfortunately, the sound effects are worse than the graphics and are the game’s low point, reminding me of something I might hear on the Apple II or Atari 2600. I gave Golden Axe a 1.5 instead of a 1 because the excellent music and cool cutscenes prevent the game from being completely devoid of value. These things mean little without at least tolerable game play however, and that is something that this game completely lacks. I don’t underatand how the developer could spend so much time creating cutscenes and excellent music and not focus on the things that really matter. Buy Golden Axe on GameGavel or Amazon. Tagged Arcade, Beat 'em Up, Golden Axe, PC Engine, Renovation, Review, sega, Telenet, Turbo CD, turbografx, turbografx-16. Bookmark the permalink.